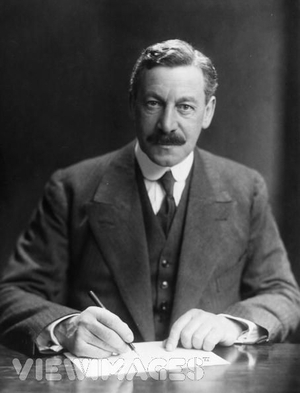 Emerging from intense controversy, the British politician Herbert Samuel (1870-1963) was appointed the first High Commissioner of Palestine, where he served 1920-25. A Jew and an influential Zionist, Samuel bent over backwards not to favor the Yishuv, to the point that he forwarded the interests of the Palestinians most hostile to the Jewish presence. Most notoriously, Samuel appointed Amin al-Husseini as mufti of Palestine, a position which Husseini used to become the most powerful figure in the mandate and the Palestinian who did the most-ever damage to Zionism (yes, even more so than his nephew Yasir Arafat). This century-old history comes to mind in watching the first months in office of Secretary of Defense Chuck Hagel. During his confirmation hearings, Hagel denounced many of his prior statements about Israel and Iran and then, as I have noted elsewhere, he chose to have his first face-to-face meeting in March with a foreign counterpart with Israel's Defense Minister Ehud Barak. Despite major cuts to the American defense budget, Hagel promised in his meeting with Barak his intent to ensure continued funding for the Iron Dome and Arrow missile defense systems. Pentagon press secretary George Little explained that "during the meeting, Hagel expressed his strong commitment to Israel's security, including maintaining Israel's qualitative military edge and continued U.S. support for missile and rocket defense systems in spite of fiscal constraints." Little also reported Hagel's saying that he and Barak have had an outstanding working relationship. 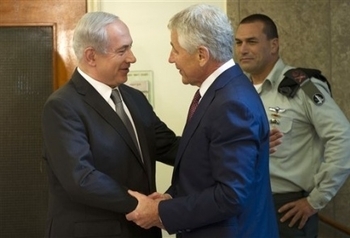 Hagel also had warm words for Israel: "I appreciate the strategic relationship between our two nations and look forward to strengthening cooperation between the two defense establishments." And two systems to be sold to Israel — a new generation of aerial refueling tankers and advanced missiles that home in on radar signals to destroy air-defense sites — would be important in any attack on Iran's nuclear facilities. Mr. Hagel said the weapons sales served as "another very clear signal to Iran." Binyamin Netanyahu and Chuck Hagel, best of friends. This is a time when friends and allies must remain close, closer than ever. I'm committed to continue to strengthen this relationship, secure this relationship, and as you know, one of the main reasons I'm here is to do that. ... I was able to take a long tour up in the north and the eastern borders here, and once again it reminds me of the dangers and difficulties and challenges. But I believe together, working with our allies and our friends, we will be able to do what is right for your country, my country, and make this region a better region and a more secure region, and make Israel more secure. On Monday, Hagel was asked whether he believed it would be advisable for Israel to attack Iran on its own. "That calculation has to be made by Israel," he replied after noting, "Israel is a sovereign nation; every sovereign nation has a right to defend itself." Hagel did not mention a concern that U.S. officials have voiced in the past—that an Israeli strike would run the risk of igniting a wider war that could draw in the U.S.
Hagel wrapped up his three-day trip to Israel by visiting a special forces unit that trains military dogs to find hidden explosives and weapons. He mingled with the soldiers and watched a brief demonstration of the dogs' skills. (1) Henry Kissinger also fit the Samuel pattern, leaning more against Israel to offset perceptions of him as pro-Israel. (2) As the Samuel and Hagel trajectories suggest, politics is an ironic business. (3) Sometimes one is better off when an opponent feels compelled to prove his bona fides. July 18, 2013 update: It's déjà vu all over again, what with Samantha Powers (Obama's nominee for ambassador to the United Nations) pulling a Chuck Hagel, renouncing her prior anti-Israel statements in testimony before the Senate Foreign Relations Committee: "The United States has no greater friend in the world than the State of Israel. ... Israel's legitimacy should be beyond dispute, and its security must be beyond doubt. ... Unilateral Palestinian statehood measures just won't work." Will she follow Hagel and also pull a Samuel? 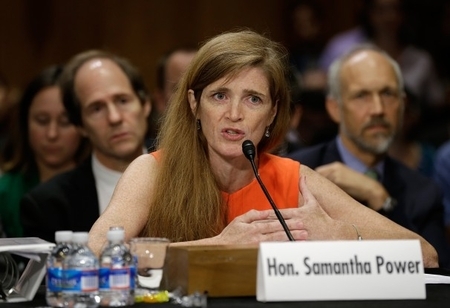 Samantha Powers at the Senate Foreign Relations Committee confirmation hearing. Oct. 31, 2013 update: Hagel annouonced, in a speech to the Anti-Defamation League no less, that Israel will be the first foreign country to have access to the Bell Boeing V-22 Osprey aircraft, purchasing six of the advanced tilt-rotor plane, the only one in the world that can land and take off vertically by tilting its two propellers, then bring them down and fly as a turbo plane. Hagel noted that the V-22 "will greatly enhance the range and effectiveness of Israeli special forces" and promised that the Israeli shipment would be part "of the next order to go on the assembly line." 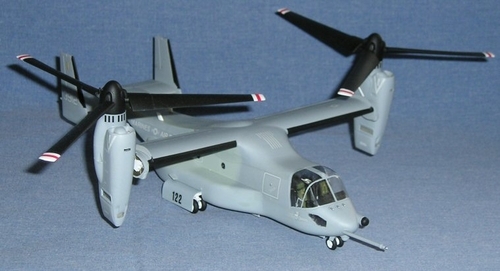 The Bell Boeing V-22 Osprey aircraft. It's true that sanctions—not just U.S. sanctions but U.N. sanctions, multilateral sanctions—have done tremendous economic damage," Hagel told Bloomberg. "Even many of Iran's leaders have acknowledged that. And I think that Iran is responding to the constant pressure from Israel, knowing that Israel believes them to be an existential threat. I think all of this, combined, probably brought the Iranians to where we are today. Hagel went further, and absolved Netanyahu of Kerry's charge: "I don't think he's intentionally trying to derail negotiations. ... I think Prime Minister Netanyahu is legitimately concerned, as any prime minister of Israel has been, about the future security needs of their country." Nov. 14, 2014 update: Hagel today resigned as secretary of defense.